Planning and designing space for Custom and Large Entry Crystal Chandeliers has become a truly emotional experience in which designers attempt to incorporate colors, textures, shapes and lighting to make each room memorable and in its own way, touch us. 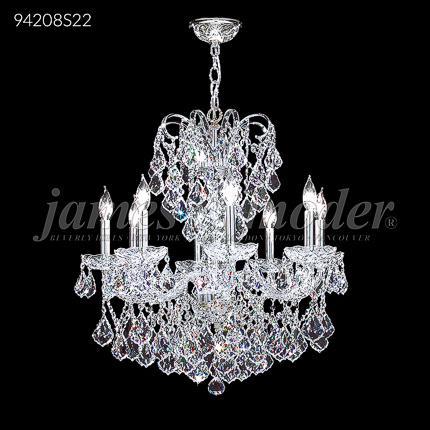 At james r. moder® Crystal, we understand that and work to make sure that each Fashionable Crystal Chandelier in a Custom or Entry Space is an heirloom to be treasured from generation to generation. We source many Crystal components from manufacturers in Europe and around the world and feature Crystal from Austria. This is where the heritage of international designer james r. moder® originated, and where European artisans, over a period of 250 years, have developed and perfected the JRM® Regal™ Crystal Hand-Cutting and Polishing techniques. In addition to Swarovski® crystals (-00), SPECTRA® by Swarovski® crystal (-11), IMPERIAL™ Crystal (-22), we also offer for Custom spaces our REGAL™ Hand-Cut and Polished Crystal (-44) and our BUDGET Crystal (-33) for budgetary reasons. 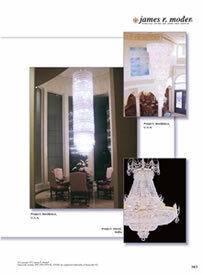 To bring home an added Designer Dimension, we also provide Crystal in a variety of colors. Only a very few Crystal Chandelier manufacturers in the world have the capability to design, engineer and manufacture a Crystal Chandelier which is over 21' (252"/640cm) in diameter, along with 43 additional specially designed Crystal Chandeliers for a discriminating customer. We are proud to have been selected for this huge project, and to have completed it 'On Time and On Budget'. 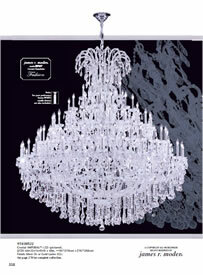 At james r. moder® Crystal, we have a Design Team ready to adapt current designs or develop entirely original Chandeliers for our Customers depending on their needs. No project is too large! 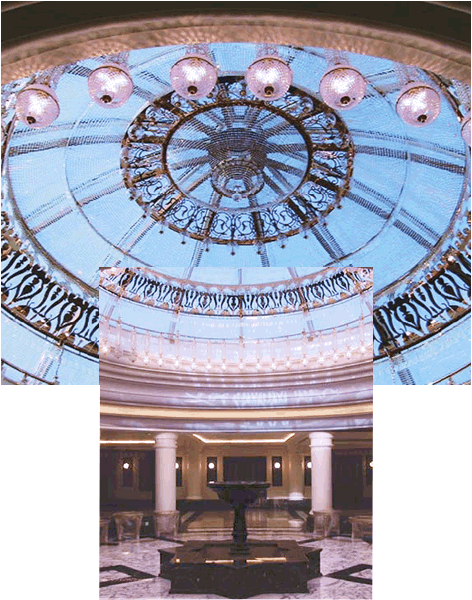 Whether it is a Home, Hotel, Restaurant, Banquet Hall, Church or Movie Set, we can provide a Crystal solution. Some of our custom clients have included: Stock Exchange - Abu Dhabi, U.A.E., Radisson Hotels, Marriott Hotels, Foxwoods Casino, Hard Rock Hotel Casino - Lake Tahoe, as well as major residences and projects in the USA, Canada, Switzerland, France, Japan, Singapore, Brazil, Mexico and throughout the World! To learn more about, and see examples of, our "Custom Chandelier Collection"
Rock Crystal was originally added to Chandeliers to reflect the intensity of candlelight to make it brighter and stronger. Connoisseurs know that Crystal used in Chandeliers has evolved since the 16th Century to become not just transparent glass, but depending on quality and cut, one of the most treasured lighting accents in the world. Artisans from Europe have handed down their expert and closely guarded techniques for cutting and polishing Crystal. 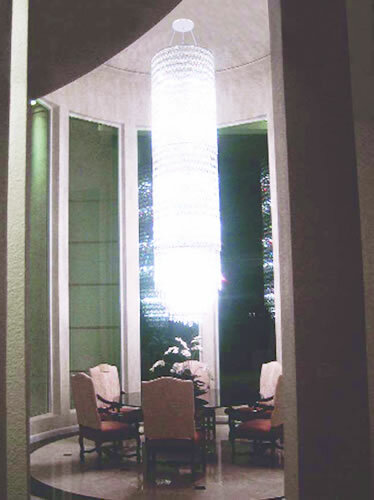 We, at james r. moder® Crystal, have adopted numerous interesting Crystal shapes and thoughtfully incorporated them into our exquisite and Fashionable Custom and Large Entry Crystal Chandelier designs. The heritage of james r. moder® goes back to Austria where the finest Crystal components are manufactured. He and his team have designed and manufactured Fashionable Crystal Chandeliers to the highest quality standards and are now celebrating over 50 Years of North American Crystal Chandelier design and manufacturing leadership.